'Marvel Two-in-One Epic Collection: Cry Monster' review: An ever-lovin' fantastic Thing feature – AiPT! Double up on your love of the ever lovin’ Thing with this long collection. The Thing is the kind of character you grow to love because he’s so darn unlucky. Not only was he changed into a monster, but nothing ever seems to go his way. Stan Lee originally wrote him as a sad sack (and Dan Slott seems to be picking that up in the recent fresh start) which makes him hard to hate. In this new collection clearly timed to coincide with Fantastic Four #1, Thing goes on a heck of a lot of adventures fighting Hulk, Thanos’ goons, and even Morbius. Watch out Yancy Street! Benjamin Grimm, A.K.A. the Fantastic Four’s Ever-Lovin’ Blue-Eyed Thing, is stomping his way into his own series – Marvel Two-In-One – guest-starring the greatest heroes in the Marvel Universe. In this inaugural MTIO Epic Collection, the Thing battles the Incredible Hulk, the minions of Thanos and the giant monster Braggadoom, and even brings the Guardians of the Galaxy back into the fi rmament of Marvel stars. He’ll also join forces with icons like Iron Man, Thor, Black Widow, Daredevil and Luke Cage. Topping it off, the Thing joins the Amazing Spider-Man in a MTIO/MTU crossover classic! This book is over 500 pages long, featuring Marvel Feature #11-12, Marvel Two-In-One #1-#19 and Marvel Team-Up #47 since it finishes off a two-part story. These comics were published between 1973 to 1976 so they’re just modern enough to be less verbose and a little sharper on the art side of things. This is a fun collection, never taking itself too seriously and delivering on tons of cameos from heroes and villains. 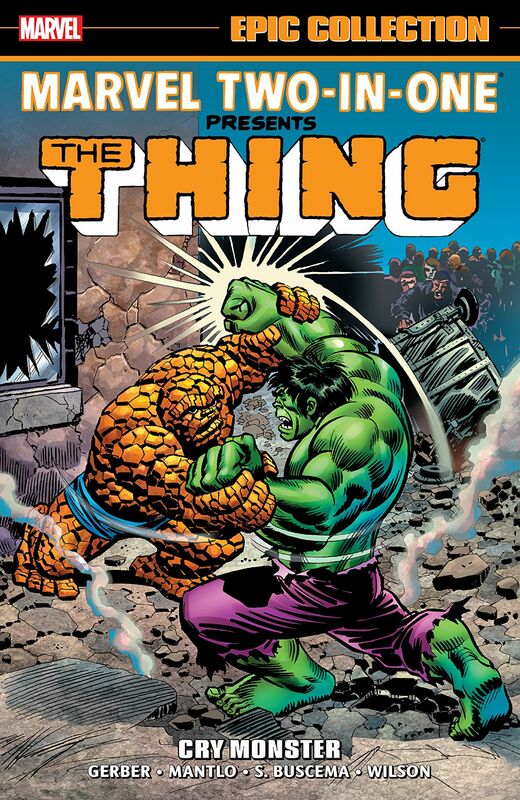 The very first story kicks off with Thing basically being forced to fight the Hulk. His luck dries up as he has to walk home from that and he gets thrust into a battle with Thanos’s goons with the help of Iron Man. From there he’s looking to pick a fight with Man-Thing (because he stole his name) and later goes on a time-traveling Christmas adventure with Ghost Rider. Even the original Guardians of the Galaxy make an appearance, which shows how really anything can happy in this book. The Thing is a great character for Marvel Two-In-One because he’s so easy going. It’s fun to see how characters like Iron Man don’t have a high opinion of him and yet that never bothers the big pile of bricks. He’s down on himself, throws off that ever-lovin’ rage, and is generally good-hearted. He’s a character that doesn’t change too much and serves as the rock center to many of the stories. The art is lead by Ron Wilson and Sal Buscema with the likes of Gil Kane, Jim Starlin, George Tuska, Her Trimpe, Bob Brown, and Arvell Jones. It’s interesting to see how Thing doesn’t change much over the three years this book collects, with thicker inks used to show off his rock body. There are some real weirdos in this collection. The book can be way too hokey for its own good. A space alien is taken in by the Fantastic Four who has the mind of a child. You can imagine what kind of jokes that brings on. Or take the Ghost Rider story, which basically has Thing and Ghost Rider dress up like the Three Wise Men who visited Jesus. Thing’s schtick of being angry so as to spur on a plot can also get redundant story after story. I ended up liking this collection more than I thought due to the fun cameos and light-hearted, action-oriented storytelling. The Thing is a character that has to grow on you and, if you read this collection, he sure will. A good collection with a well rounded slice of Marvel characters and villains.